Expressing thoughts, ideas, feelings and emotions from a different point of view. US demands UN sanctions on Iran US Secretary of State Condoleezza Rice has urged the UN Security Council to adopt a resolution imposing sanctions on Iran over its nuclear programme. Iran rejects Western allegations that its nuclear programme has a military aspect, and maintains it is enriching uranium only to generate electricity..... China's UN delegate Li Junhua said it was premature to say that the Security Council was in a position to impose sanctions. The now the news.... behind the news... 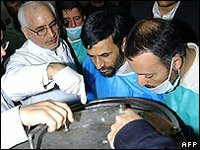 Besides the US doing Israels bidding... the US is also after Irans oil supply... and has been slowing squeezing the life out of Iran... Oil rich... yet shackled by the sanctions imposed on it by the US..
Iran has the world's second biggest proven oil reserves after Saudi Arabia and the second biggest gas reserves after Russia. Iran's geo-strategic position and its already-existing network of pipelines also make it a key actor in the energy world...... Iran is currently Opec's second largest producer..... But international and domestic factors have hampered optimal use by Iran of its energy resources since the 1979 revolution that toppled the Shah. Iran's oil and gas sector suffers from under-investment as a result of US sanctions, which have been in force for more than two decades. The sanctions have not only kept US companies out of Iran but have also served as a disincentive to other countries' firms and multinationals because of the threat of secondary sanctions (approved by the US Congress in 1996).